I remember how overwhelmed I was when I was shopping for my first car. I had no clue what to look for so the car I chose fell apart within months and was worth less than half what I paid for it. 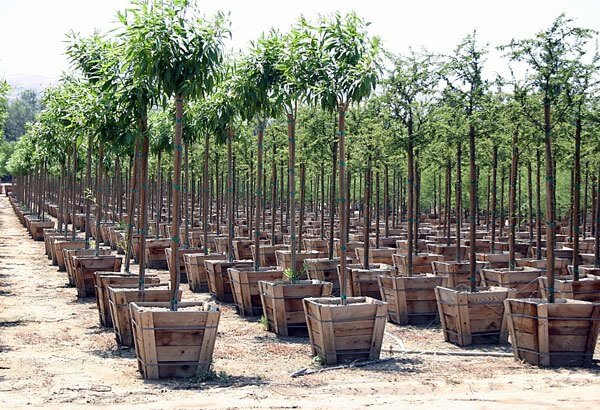 Trees may not require as much of a financial investment as purchasing a car but it is still important to know what to look for when selecting trees in a nursery so you do not choose the wrong tree or waste money. First, look at the leaves of the tree. Leaves are indicative of the tree's overall health and the easiest to examine as long as the tree has leafed. Make sure the leaves appear healthy and are not undersized or falling off and there is no evidence of insects or pests including under the bottom of the leaf. Second, inspect the tree to see if it has become "pot-bound". When trees remain in their container for too long their roots can become permanently stunted even after removed from their container and planted. A tree may not recover from being pot-bound, preventing it from reaching its full potential size. Weeds or moss growing in the soil. This can mean that the tree has been there for too long. Third, look for signs that the tree is still growing. Green shoots at the tips of the branches and/or new buds are the most telling signs and most commonly found in the spring/early summer. Fourth, examine the condition of the stem and branches for any potential problems. There should only be one trunk or main stem and no damage directly to the stem or larger branches such as breakage or bark damage. It is okay if there are some broken twigs because they can be removed when pruning. Last, ask questions, lots of questions. Nursery staff are full of knowledge and want to keep you as a customer. By sharing with them your goals and information about the planting site they can help you select the most appropriate tree. Print out the Right Tree, Right Space, Right at Home guide and bring it with you to the nursery to remind you to ask the important questions. You can also learn more about tree selection and planting by taking one of our classes. The upcoming Treescape Design Workshops on March 31 and April 28 will help you plan a custom treescape plant just for you.